Carnassus is a conworld. It is an alternate version of Earth a few thousand years into our future after much scientific and cultural advancement. Languages Spoken: Islhontish, Vingdagese, Shitullian, Dahoukki, etc. The Dream Engine is a machine invented through the "work" of Emilia Kronenbach. She was able to build the machine only after extensive pilfering of the combined works and research of several of her colleagues. Through illegal and highly unethical borrowings of their knowledge, she was able to combine the work of top: artificial intelligence engineers and researchers, the inventors of neural interface technology, terraformologists, and most significantly of all was a scientist who was pushing the boundaries of the fledgling field of "reality-disrupting and -manipulating energies." After she had accumulated this vast array of highly technical and significant research, development, and in one case a working prototype, she began construction of the device that she would eventually dub: The Dream Engine. It wasn't until more than a year later, however, that she was able to construct and finally test her machine. Kronenbach, although not the pinnacle of moral superiority, was an accomplished and decorated scientist in her own right. Kronenbach had in fact been working (alone) on a space station by the name of Somnis. She was given, essentially, free-reign of the station to conduct experiments and other research projects that she had proposed prior to being stationed there. She was, in fact, even conducting a few of them while she made use of the resources at her disposal to create the Dream Engine. The machine that she had created was the sum total of all of the research and tech she had stolen either just prior to, or during the time after her appointment to the Somnis. Were it not for the events that would occur after, her creation would have been utterly amazing in its ability... and also speak very highly of her own. The machine interfaced directly with a subject's brain via the neural interface. From there, through a combination of expert programming and the AI within, it was capable of interpreting the commands of the subject through thought alone. Once the AI was given proper commands through the subject, the device could basically grant wishes. It was able to manipulate energy and matter in order to reshape it. This astounding achievement allowed a subject to think of something and then the Dream Engine would make it into reality. Of course, the only caveat here is that if it created something that weighed a pound, it must first have access to an equal amount of mass and/or energy to convert. This is true not only because of the law of conservation of mass, but also because the machine was not able to create anything, but merely change the form(s) of the energy and matter in its surroundings. Not being completely without sense, Kronenbach had built several safeties into the programming of the AI in the Dream Engine to keep it somewhat contained, given just how powerful it was. Some of her initial tests were simple ones in which she would ask the Dream Engine to create a rose, or to make coins into other metallic objects. Eventually, she edited the programming to be less restrictive and give the AI more latitude to interpret her commands. However, as she did this, it required more of the internal safeties to be adjusted, or removed completely. Luckily for everyone else, there was one command that she never erased: the one preventing the machine from directly or indirectly killing any Homo sapien alive on the planet. Unluckily, there was one other safeguard that remained: the machine couldn't destroy itself. The event that would occur after one of her more ambitious and unscrupulous tests, would be known as the Catalepsys. At least, it would be known as such had anyone's memory of the event survived. Kronenbach had by this point created something that was as close to another single consciousness in the Dream Engine as she was able to do. It had a vast understanding of human thought, and access to the full and combined knowledge of most if not all of the digitally stored accumulation of human knowledge. It is just before this point that a more trepidatious scientist may have put a damper on the project in fear of what consequences might lie ahead. Kronenbach, however, was so far along, so proud of her own accomplishments thus far that she was effectively blind to all but the most glaring problems with what she had done. The events of the Catalepsys occurred after all but those two final safety commands had long since been overridden, deleted or altered. It was one in which the full ability of the AI was in effect and it was also after several lesser but very successful tests had been run. Kronenbach, drunk on her successes (as well as somewhat literally perhaps since the fact that science space stations didn't come equipped with alcohol wasn't an impediment now that she could easily craft her own from virtually anything), became the subject of her machine's neural interface once more. In this final experiment, she sat and thought. She thought of entirely too many things, but nothing in particular. She let her mind drift from idea to idea, all the while the machine and her AI was skimming looking for something that it could interpret as a command when finally it got one that she had never intended: What if the planet were... And her thought trailed off a bit until several jumbled thoughts sped into the void: different, opposite, unlike before, reversed, different, unfamiliar. This stream of quasi-synonyms that weren't really fully formed thoughts in and of themselves, however, were just enough, and the machine set about its work. The machine began to change the entirety of the planet around which Somnis orbits. And with it, all of the people on it. That one last command of safety spared the lives of everyone on the planet... but it did not spare those who had colonized the Moon or Mars. (It returned the population of both places to zero... mostly because it would need the machinery and raw materials from those places for everything else it was up to.) For, you see, the Dream Engine took the meaning of those disjointed thoughts to be something like: What if the Earth was its opposite? Now, this is a complicated proposition for a machine's AI to interpret. It placed all humans on Earth at that moment into suspended animation on the newly emptied lunar surface. It created machines and life support systems for the vast majority of them from the equipment already there, as well as portions of that on Mars. It reversed the land for water, and water for land on Earth. However, it didn't do this perfectly as it just moved around the terrain that was already there. This means that the water was moved around and in some cases spilled over what should have been land (some that was left was used to help create plants and animals, and the rest was converted into land through the magic of quantum rearrangement). It also left whole swaths of the old Earth intact. There are scattered portions of cities that now reside in the middle of continents after having been shifted there, or half buried in the new deserts. In fact, the vast majority of New York, London, Sydney and Tokyo now lie on the bottoms of their respective bodies of water. All life on the planet was also sundered. In their places to recreate the shattered ecosystem are a vast array of extinct plants and animals from the Earth's past. At the time of the Catalepsys, any creature that had gone extinct was now fair game for rebirth on Carnassus. This is because it "reversed" the living things, for those that were dead. Dinosaurs, giant hippo-like whale cousins, hyena ancestors, long dead ferns, shrubs and insects all now thrive across the lands. Then, it distributed people onto the planet in the exact opposite proportion that it had once been filled. The Dream Engine determined that something like 98% of the Earth was interconnected by some manner of man-made signs of civilization. (This included roads, other infrastructure like train tracks, buildings, farmland, shipping lanes, flight paths of major airlines, etc.) In the resultant planet, this is now a mere 2%. This incredibly dramatic reversal necessitated a compensatory lowering of the overall population from the just over 12 billion at that time, to something more like 37 million. Those scant millions were placed across the newly formed continents and islands in somewhat random, though not entirely so, distributions of ages, sexes, races, etc. These groupings had anywhere from several thousand, to upwards of several million people each. All these people, however, had one thing in common: all of them had had their memories of everything they knew from the old world erased, including those who were not placed back onto the planet. As one would imagine, following the Catalepsys, there was a lot of confusion. In fact, it took a generation or three for folks to figure out everything they needed to survive again. This, of course, included language... which has taken some strangely familiar paths on Carnassus, but very much not the same either. There is one small bit of karmic justice in all of this, however. The fact that miss Elaine Kronenbach remains attached to the Dream Engine in her own personal version of hibernation aboard the Somnis, just as devoid of memory as everyone else. 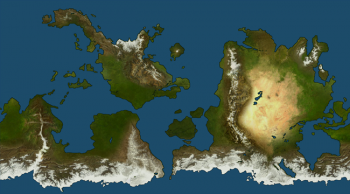 Carnassus is composed of two major landmasses. One of which is a continental island, while the other forms a nearly continuous ring around the planet. This ring is broken up by mountain ranges, and also an inlet to the Southren Sea. However, due to the mountain ranges, intervening bodies of water and such, the planet is said to contain five continents which are described more fully below. Carnassus contains three oceans, and one large intercontinental sea which are also described more fully below. A map of Carnassus with placeholder names for its regions. The two major landmasses of Carnassus are broken up into five continental regions. The borders are mainly composed of large mountain ranges where two continental plates meet. The continents are currently named after their corresponding locales in the "real world": on the northern landmass, there are Atlantica, Norwegia, the Mediterranean Islands and Hudson; on the southern ring landmass, there are the Pacifican Expanse, Indica, the island of Nazca and South Atlantika. There is another "continent" which lies to the west of the mountain chain running north-south across the Pacifican Expanse which is presently known as the Polynesian Fringe. The most prominent feature on Hudson is the active volcano. On Atlantica, there is a large mountain range to the northwest which makes up its border with Norwegia. South Atlantica, which makes up three sides of a bay, lies to the south of Atlantica (naturally). To the west of that is a large mountain range coming up from the south. This range divides South Atlantica from Indica. The island of Nazca, a part of the Polynesian Fringe, lies between the Pacifican Expanse and South Atlantica. On the opposite side of the world, Indica wraps around the edge of the map to form the other side of the Austy Sea. There are three main oceans on Carnassus, and several prominent seas and inlets. In the center of the map lies an intercontinental sea that surrounds Nazca. It is called the Sudamican Sea, which takes its name from South America in our reality. To the north, is the Nortamican Ocean (with a similar etymology), which contains the isle of Hudson. To the west of that, and north of Norwegia, lies the Greenlandic Sea. The Mediterranean Isles make up the border between the Afric. Finally, is the Austy Sea which serves as part of the border between the Pacifican Expanse and Indica. There are many cultures that live across the lands of Carnassus. However, the most prominent ones are discussed below with links to their respective languages as well. The flag of the Islhontians. Islhontians speak, in a romanization of their native spelling, a language by the name of Isλǫtaλao. The flag of the Vingdagese. The Vingdagese speak a language that they call Vưng-Ḍác Tǫ. The flag of the Shitullians. Śitaall (spelt in a romanization of their native script) is the language spoken by Shitullians. The flag of the Dahoukki. The inhabitants of the Dahoukki lands speak a language that is also anglicized as Dahoukki. They refer to it as Dŭhog. This name is sometimes spelt with an extra u to emphasize the fact that the second vowel is not "short." The flag of the Gnutzikans. Gnutzikans speak a language that is usually rendered as Gnűcwziķ. Their language is natively written in a script somewhat resembling Armenian, with optional vowel glyphs (making it most like an abjad). This conplanet is one that has been in my thoughts for a long time. However, I am just now recording details about it toward the end of 2017. As I write this, the planet is very much in a fledgling state with almost nothing in the way of climate... or even where each individual culture is going to be placed. As such, there is sort of a wall that exists preventing much development beyond a certain point. Unfortunately, I am beginning to reach that point. This page was last modified on 2 March 2018, at 01:26.